Live Life Like a Best Seller: Happy New Year!! I know it is a little late, but for what it is worth, HAPPY NEW YEAR! How has 2012 been treating you so far? We are almost all the way through January! This year is flying already! Are you keeping up with your New Year's resolution(s)? One of my resolutions this year (along with losing a few pounds, and perfecting my Serbian) was to stay in touch a little better (Skype!) with our friends from home as well as constantly building community wherever we happen to find ourselves. Chris and I rang in 2012 not once, not twice, but THREE times! We are serious about tackling that New Year's resolution! Two of my best friends from Kentucky. Since Chris and I were in the States on December 31st, we celebrated the upcoming year with some of our best friends from Kentucky. It was a fabulous evening! 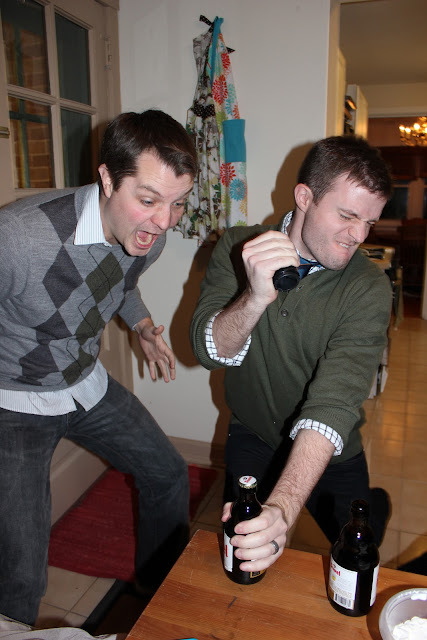 Chris and his great friend trying out Chris' automatic bottle opener. This picture just makes me laugh! Of course we missed the December 31st parties and celebrations all over Subotica, but lucky for us, most Serbians celebrate the New Year twice! Since Serbia is primarily Orthodox, the county still observes the old Julian Calendar that places Christmas on January 7th and the New Year on January 14th. Most of the world follows the Gregorian Calendar (The one Americans are used to) and some families in Serbia, who are not Orthodox, follow that calendar as well. As you can imagine, there are many mixed families in Serbia where one parent is Orthodox and one Catholic (etc.). Rather than observe one set of holidays, most people just party through the entire season and celebrate two Christmas' and two New Years'. From December 1st - January 14th, Serbia comes alive with Slava's (Saint's Days - to be explained in a later blog), two doses of Christmas, Holiday markets, rakija drinking, two New Year celebrations and excessive gun shooting. Most companies significantly slow down as well and often people take vacation for several weeks at a time since little happens at work. Crowded bar in Subotica for the Serbian New Year. 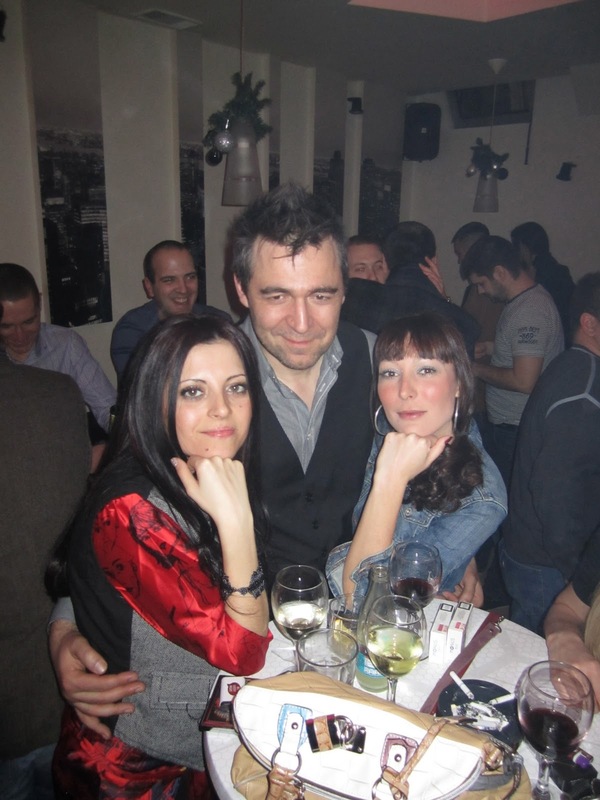 By the time January 13th rolled around, we were back in Serbia ready to ring in the New Year AGAIN. 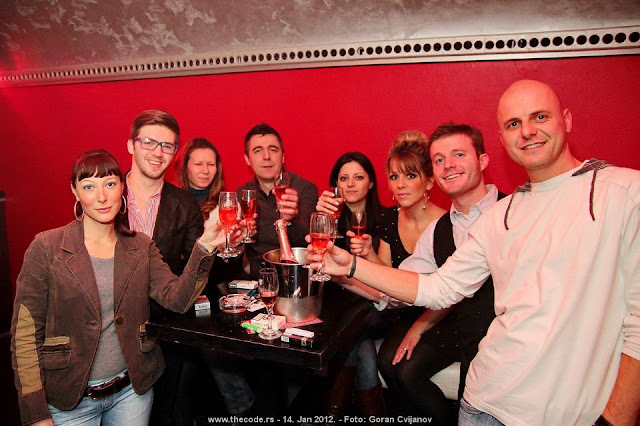 Chris and I and 10 friends spent the evening at a bar in Subotica called "Bulivar." A 6-piece band played well known Serbian songs heavy with sounds of the accordion. I am not going to lie, Chris and I did not recognize much of the music, but it was fun to watch the whole place erupt with dancing and arm waving when a familiar song filled the air. Towards the end of the evening, the band started playing a famous 1980's song by the infamous Lepa Brena titled "Mile Voli Disko" (Mile loves Disco), and I knew that song! In fact, I was able to sing almost every word in Serbian. As we all danced around and belted out the lyrics, I felt like I belonged. Chris didn't exactly have the same experience of belonging, but he did get a few good laughs at my expense. There is a video that may make it onto the blog soon. I just had to share this photo. On a busy weekend night, it is typical to see two "promotional girls" dressed in the exact same thing, selling cigarettes, lighters, or some sort of alcoholic beverage. I guess they make money because promo. girls show up everywhere. These two ladies cracked me up because they were dressed in dirty-santa-lingerie on January 13th and they were selling spiked cider. I was trying to discretely take this picture, but I think one of the girls caught onto what I was doing. Oh well. . . anything for the blog! The following evening, we went out AGAIN! I promise, we don't EVER go out this much! 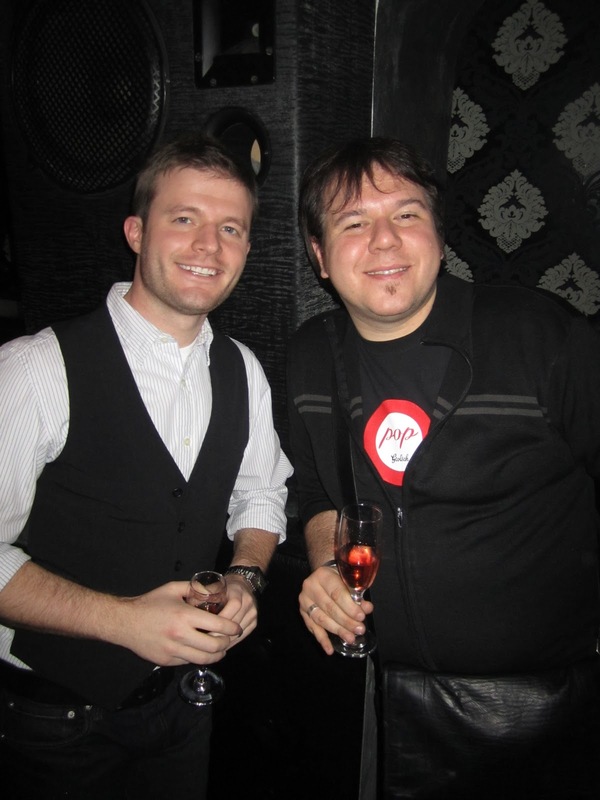 We said we were celebrating 2012 for a third time, but in all honesty, we went to The Code Nightclub because our friend, David, was hosting a Torley Champagne Party. 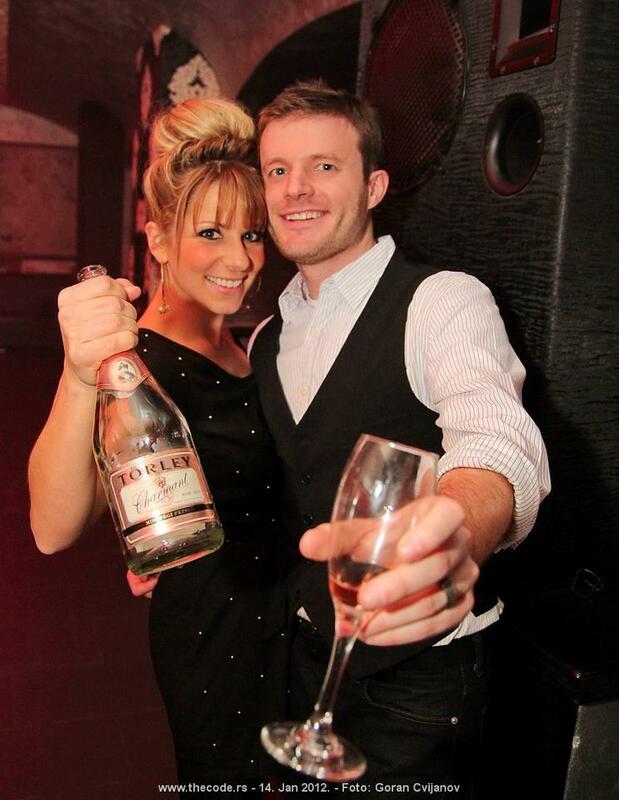 Friends don't let friends promote champagne alone! Welcome 2012! We think you'll be a great year! After three celebrations, Chris and I are ready for 2012! Hope you're ready for it too! Make this year absolutely unforgettable! Chase your dreams, and Live Your Like Like a Best Seller! Hahaha - I only love it because it is the only Serbian song that I recognize and KNOW! :) Plus Lepa Brena's career is fascinating to me for some reason. She was like the Britney Spears of the 80's in the Balkans.